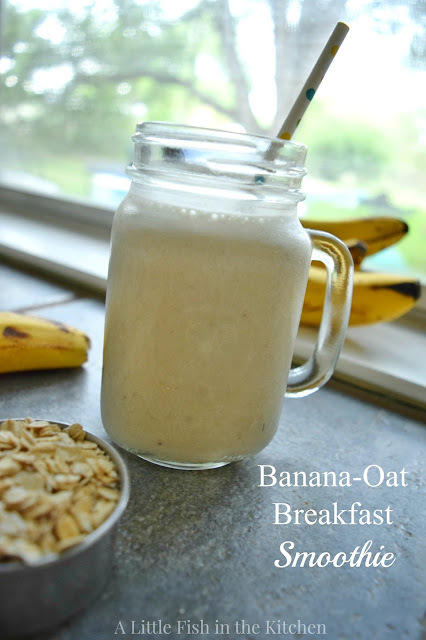 This quick and easy banana-oat smoothie has been my absolute favorite thing to make for breakfast lately. Not only is it really healthy, it's also really satisfying. I stay feeling full for at least a couple of hours after a drink this creamy treat and that's not normal for me when I've tried to get by on breakfast smoothies before. Maybe it's just because I know they are there, but I think the hearty old-fashioned oats that are swirled into this smoothie are what make it so filling. Okay, so when I say 'filling' here, I don't mean that you will feel like you ate a plate full of biscuits for breakfast after drinking this pretty smoothie! I guess it might be best to go back to calling it 'satisfying' because that's what it truly is. Smoothies are a great way to add some variety into your morning routine and they are simply the best portable breakfast option out there, if you ask me. It takes just a bit of prep in the evening to have everything ready to swirl a healthy breakfast together before you walk out the door in the morning. All the prep needed for this recipe is remembering to slice and freeze a banana the night before. Easy and nourishing, smoothies are also a great way to sneak some more fruit and vegetables into your kid's daily diets in a deliciously disguised liquid form. I can say from personal experience that smoothies have helped to convince my own finicky kids to enjoy more fruit. Even kids eat with their eyes first, so remember to pick up some pretty paper straws at the craft store and your kids will be in for a festive breakfast treat! I decided to break the ice on my YouTube Channel while my kids were at a camp on Monday morning. It's a little rough in some places, but my hope is that these videos will get better and easier with time. :) Please subscribe to my YouTube Channel it would be great to see you there! 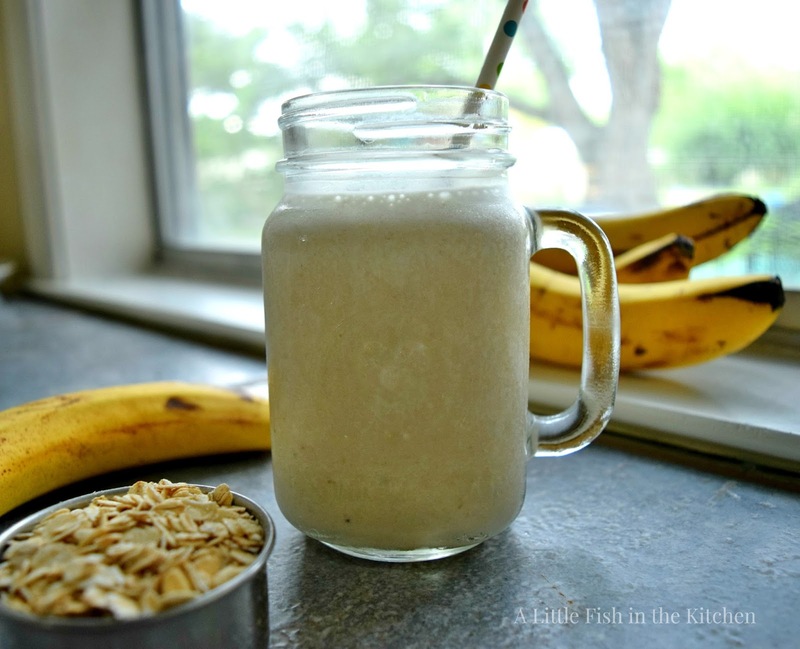 The satisfying smoothie is a quick, delicious and healthy way to start your day. Kids will love this breakfast treat! Add all ingredients together in a blender and mix until smooth. Enjoy! A Little Fish in the Kitchen participates in the Amazon Services LLC Associates Program, an affiliate advertising program. Blog posts may contain affiliate links to products I honestly use and love. I earn a small commission, at no extra cost to you, to help with blog expenses when you make a purchase through an affiliate link. I thank you so much for your support! That looks satisfying and healthy too! Mmmm, oats! Love them for breakfast. Or lunch. :-) Thanks! So simple ... and the bananas sound yummy! We think it a great quick breakfast, thank you Beth! 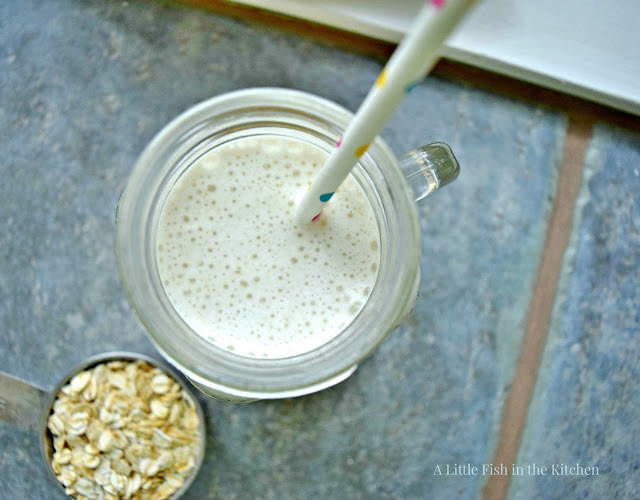 love this smoothie--i can see how it would be satisfying without weighing you down first thing in the morning! Great video Marcelle, I'm a subscriber!